It is a small irony of history that playwright, prisoner, and Czech president Vaclav Havel died on the same day as North Korean dictator Kim Jung-il. But the world that Havel helped shape had reduced Kim Jung-il to a strange museum piece the last of the totalitarian rajas, bodyguarded by lies, surrounded by suffering. In part because of the personal courage of this diminutive dissident and leader of the Velvet Revolution, once widespread walls of communism collapsed under their own weight. Democracy defeated dictatorship. Truth triumphed over tyranny. Havel was a hero who shrugged off the title, understandably uncomfortable with the assumptions of stony perfection. But in the long winter that followed the Prague Spring, he did more than any other Czech dissident to keep hope alive behind the Iron Curtain by persistently defying the Soviet-backed state. He refused to flee to the West when he had the chance, preferring to stay and create a countercultural resistance to the corrosive conformity of communism. His 1978 essay “The Power of the Powerless” deserves to be remembered alongside the works of Gandhi, Martin Luther King, and Nelson Mandela as landmarks in the literature of civil disobedience. In the essay, Havel imagines a grocer hanging a “Workers of the World, Unite!” sign in his shop window and comments, “If the greengrocer had been instructed to display the slogan ‘I am afraid and therefore unquestioningly obedient,’ he would not be nearly as indifferent to its semantics, even though the statement would reflect the truth … The sign helps the greengrocer to conceal from himself the low foundations of his obedience, at the same time concealing the low foundations of power. It hides them behind the facade of something high. And that something is ideology,” Havel wrote. “Ideology offers human beings the illusion of an identity, dignity, and morals while making it easier to part with them.” Amen. 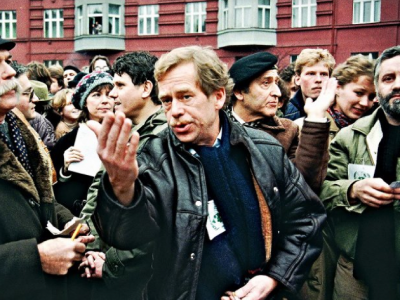 In the heady and hopeful days after the fall of the Berlin Wall, Havel was the perfect icon of epochal change, an artist using his newfound authority to break molds and send forth ripples of new possibility. His vision of a civil society was decidedly human scale and skeptical of utopian schemes after his countryís searing experience with Nazism and Communism. “Life, with all its unfathomable diversity and unpredictability would not be squeezed into the crude Marxist cage,” he wrote. Havelís call to individual responsibility and generational responsibility was truly revolutionary because it did not look to some “other” to save us–it was essentially modest and durable, rooted in small but transcendent truths such as the desire to leave a city, state, or nation better than it was handed to us. That sense of obligation did not allow much room for cynicism or a sense of civic impotence. When the Bosnian genocide was raging, it was the former playwright who argued most forcefully for multilateral military intervention. Honoring the imperative ìnever againî was more important than lofty concepts of realpolitik that tolerated slaughter. In the end, the power of Havel’s example will endure and it will animate new generations of idealists to get involved in civic life. It is a legacy that fits this rebel with a cause, a hero of our time who deserves to be remembered for all time. This entry was posted in Columns, Featured Columns and tagged The Daily Beast. Bookmark the permalink.